If you want shades that look ultra-stylish and help you see clearly on bright sunny days, Ray-Ban Justin sunglasses are for you. 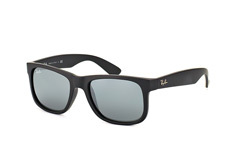 Based on Ray-Ban’s Wayfarer style, but updated with a slightly larger, rectangular frame for a modern, bold look, Ray-Ban Justin sunglasses are sure to give you a chic and edgy look. With Ray-Ban Justin frames, you get the outstanding quality that is synonymous with the Ray-Ban brand in a stunning design that will instantly update your look. 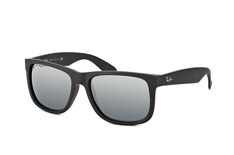 Ray-Ban Justin sunglasses at Mister Spex are available in two sizes, Small (51mm) and Classic (55mm), and the frame is lightweight and comfortable. Choose Ray-Ban Justin sunglasses from the large range of lens and frame colour combinations at Mister Spex. Invest in a pair that will work with many different outfits, such as a model with black frames and gradient grey lenses. 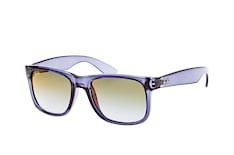 Or why not try something more audacious, such as red or blue mirrored lenses on your Ray-Ban Justins? No matter what kind of look you have in mind, Mister Spex has the right pair of sunglasses to play up your personal style. Looking for prescription lenses for your sunglasses? No problem at Mister Spex. 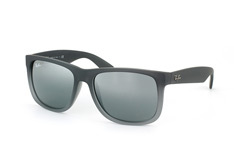 At Mister Spex, your Ray-Ban Justin frames can be expertly fitted with prescription lenses. You can also choose to upgrade to photochromic lenses that transition to a progressively darker tint depending on how much light shines on them. Prescription-wearers also have another upgrade option: amazing polarised lenses that minimise glare and dramatically increase your comfort, especially in conditions where there’s lots of reflection – such as when driving or when you’re active outdoors. 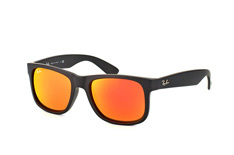 With your new Ray-Ban Justin sunglasses at hand every day, you can easily enjoy soaking up the sun with excellent vision while looking fresh and fashion-forward. You’ll love your Ray-Ban Justin sunglasses from Mister Spex so much, you’ll never want summer to end. Try Ray-Ban Justin sunglasses on online! 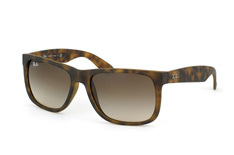 Inspired to try on Ray-Ban Justin specs? You can do it right away from anywhere with the Mister Spex online fitting tool. While Ray-Ban Justin sunglasses mostly suit oval or square faces, they can be worn by anyone who enjoys their style and shape. Try them on virtually and find out if they’ll work for you! All you need to do is upload a photo you already have, or snap a new one. 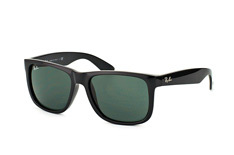 You can then use the photo to see which style and colour sunglasses you prefer, and compare the different models. After using the Mister Spex online try-on tool, you can place your order with complete confidence. All Ray-Ban Justin sunglasses at Mister Spex are competitively priced and will give you highest quality protection from the sun’s harmful UV rays. What’s more, you also get free delivery on purchases over £29 every time you order from Mister Spex. Your new sunglasses will arrive quickly in a trackable package. And if you change your mind, no worries at all! Simply return your purchase within 30 days and you’ll get your money back. Shopping for sunglasses online is effortless and fast with Mister Spex. Before you know it, you’ll be looking fabulous in the sunshine. Browse the collection at Mister Spex and discover the carefree stylishness of Ray-Ban Justin sunglasses. Order your pair today!